The Greene Team Charitable Fund provides free healthcare, disaster recovery and humanitarian aid to communities affected by disasters throughout the world. Often times quality emergency aid and healthcare is not readily available when disasters strike communities. Whether it be earthquakes in Haiti, hurricanes in New Orleans or New York or tornados in Dallas, disaster victims require attention. The Greene Team Charitable Fund was established to provide free disaster recovery and healthcare to those affected by natural disaster. Dr. Craig Greene and his team of volunteers and professional healthcare providers are able to set up mobile medical units quickly and supply urgent care when needed. Monetary donations to the Fund ensure that The Greene Team can collect the necessary medical supplies and other products needed to quickly and effectively distribute supplies to the areas in need. Often times quality emergency aid and healthcare are not readily available when disasters strike communities. CRAIG C. GREENE, M.D., M.B.A.
Dr. Craig Greene is a husband, father, orthopaedic surgeon, reserve officer (LCDR) in the United States Navy and creator of the sleep system, Dr. Greene’s Ideal Mattress. He approaches each day with enthusiasm, energy and vision to provide the greatest good for the most people. The Greene Team Charitable Fund was created to bring that same passion to supporting people in need throughout the world. After an undergraduate career at Louisiana State University where he was a member of the football team, Craig Greene received a medical degree from the Louisiana State University Health Science Center in New Orleans. He completed residency at Texas A&M Department of Orthopaedic Surgery at Scott and White Hospital, a fellowship in Orthopaedic Traumatology and complex fracture care at Harborview Trauma Center, University of Washington as well as an MBA from Yale University. 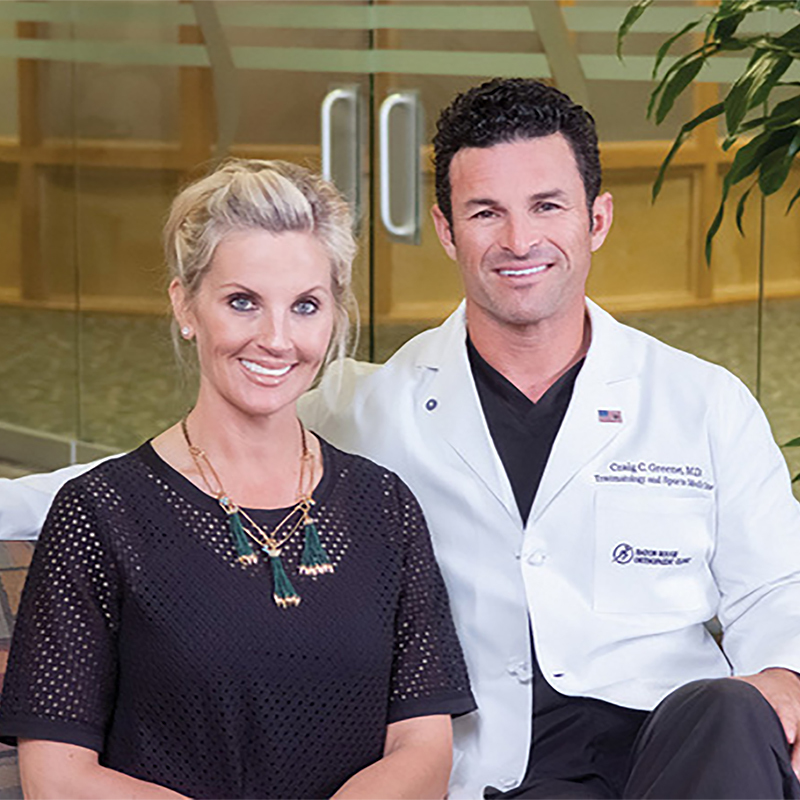 Dr. Greene lives in Baton Rouge, Louisiana where he serves as an Orthopaedic Surgeon at Baton Rouge Orthopaedic Clinic and Chief of Orthopaedic Surgery at The Surgical Specialty Center in Baton Rouge. He has served as Chief of Surgery at Our Lady of The Lake Regional Medical Center in Baton Rouge as well as Clinical Assistant Professor of Orthopaedic Surgery at LSU Health Science Center in New Orleans. When disasters strike, we partner with medical and humanitarian resource teams closest to affected areas and mobilize teams to provide emergency aid to victims of tornadoes, hurricanes, wildfires, floods and other natural disasters. Since we gain immediate access to disasters, we get right to work removing damaged walls, sheetrock, flooring as well as connecting with medical teams that are vital to caring for entire communities. The Greene Team funnels funds and supplies for teams to follow up after the initial response to rebuild or restore homes and give hope to families in need. By giving, you are helping supply much needed humanitarian attention to communities affected by natural disasters around the world. By clicking on the support link you will be redirected to the Baton Rouge Area Foundation page where your funds will be properly processed for The Greene Team Charitable Fund in order to most effectively help those in need. If you are interested in giving of your time and medical talent to disaster ridden areas or you have a specific need you would like us to consider, please give us a call at (225) 921-8238. Baton Rouge Area Foundation is a registered 501-c-3 organization. All donations are tax deductible to the full extent of the law. © Copyright 2017 Greene Team Charitable Fund. All rights reserved.